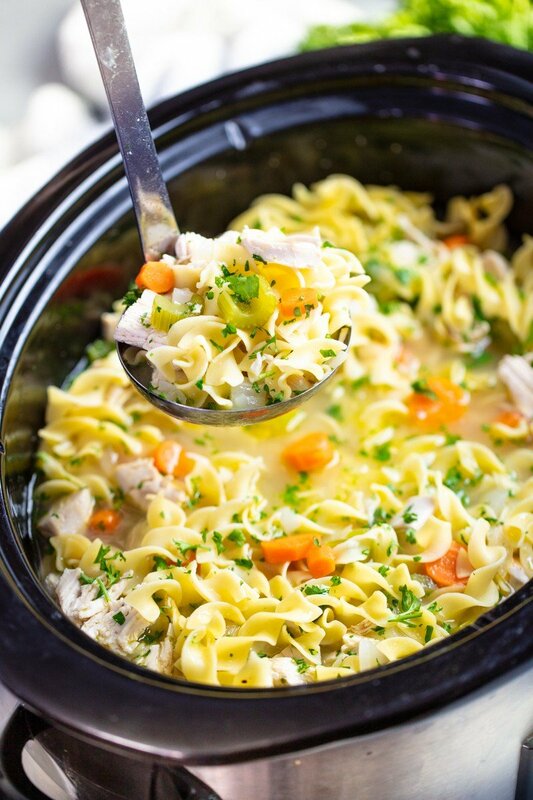 Slow Cooker Chicken Noodle Soup is total comfort food. Toss some ingredients into the crockpot and let your house smell like heaven all day long! Chicken Noodle Soup is a classic American comfort food. 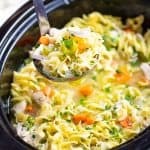 While we already have a popular recipe for chicken noodle soup on the stove, we wanted to give a slow cooker version of it as well. Your house will smell amazing as the chicken and vegetables cook low and slow all day. The noodles are added just before serving to prevent them from overcooking. Can I use other cuts besides chicken breasts? Yes, other cuts of meat can be used in place of chicken breasts. You can use thighs and drumsticks, or even a whole chicken. Cooking times will remain the same. Be warned that chicken skin does not fare well in the slow cooker and the meat will need to be removed from the crockpot to remove the skin and bones and shred the meat. Some bits of fat and skin may end up in your soup. How do I prevent the noodles from getting mushy? The noodles are added to the slow cooker about 15 minutes before serving. DO NOT let them sit longer than that in the crockpot or the noodles will turn to mush. Another option is to cook your noodles separately on the stove and add them to the soup when ready to serve. PRO TIP: Use low sodium chicken broth to give you better control over seasoning so that you can add salt to suit your own personal taste preferences. Place chicken breasts into the bottom of a 6 to 8 quart slow cooker. Top with onion, carrots, celery, ginger, and garlic. Pour in chicken broth and stir in thyme and oregano. Place the lid on and cook on low for 6 to 8 hours, or on high for 3 to 4 hours. Shred chicken with a fork. Stir in egg noodles and replace the lid. Cook on high for 12 to 15 minutes until egg noodles are soft and cooked through. Stir in parsley and serve immediately. My grandmother was from Budapest, Hungary and lived in Ohio, where chicken noodle soup was on the menu several times a week in the winter time. I once asked her how she makes the broth in her chicken noodle soup so clear which makes the colorful vegetables even more appetizing. She said the secret is to not cook the noodles with the soup, but to cook them in a separate pot, drain them and then put the drained noodles in a bowl and the soup on top of the noodles. Cooking the noodles in the soup makes the broth cloudy.